December 7, 2010 -- Howard Slinkard of Rogers was elected chair of the Board of Trustees of Arkansas State University during the board's meeting Friday, Dec. 3, at ASU-Beebe. 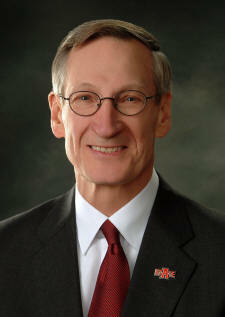 Slinkard, an attorney, has served almost four years as a board member at ASU. Ron Rhodes of Cherokee Village was elected vice chair and Mike Gibson of Osceola was elected board secretary. Other members of the board are Dan Pierce of Jonesboro and Florine Tousant Milligan of Forrest City, who completed her second term as board chair Friday. Slinkard, a senior member in the Slinkard Law Firm in Rogers, has engaged in the private practice of law since his graduation from the University of Arkansas School of Law in 1972. He formerly served two six-year terms as a member of the Board of Trustees of Northwest Arkansas Community College in Bentonville, chairing the board for two years. He has been active in many civic and professional organizations and served as president of several, including the Rogers Lions Club, Benton County Bar Association, Northwest Arkansas Indian Club and a board member and pro bono legal counsel for numerous charitable organizations in Northwest Arkansas. He also is an avid hunter and fisherman. Slinkard is a native of Trumann, where he was a 1965 graduate of Trumann High School. He holds a bachelor of arts from Arkansas State University and a juris doctor from the University of Arkansas. His term expires January 2012. Members of the ASU Board of Trustees are appointed by the governor and serve staggered five-year terms. The board has oversight responsibilities for the ASU System of campuses at Jonesboro, Beebe, Mountain Home, Newport, Heber Springs, Searcy and Marked Tree.